Among collectors, it’s a frequent topic of discussion: the stories of first watch purchases, evolving tastes, and enduring devotion reveal a great deal about how individual collectors think about our shared hobby. While my friends’ paths into serious collecting have been fairly diverse, across the group there are some patterns. Many folks I know started either with Rolex or – as in my case – with Jaeger-LeCoultre, which opened my eyes to the world of fine watchmaking and served as the foundation for my ongoing fascination with horology. While my watch-buying career started as early as 1971 with a piece bought on a student trip to Europe (see A Watch Collection Begins: GaryG And His Bucherer Chronometer), and I’d been wearing a Cartier Tank on a daily basis since 1980, my serial watch acquisitions started on a sunny day in Paris when my wife excitedly pulled me into the family-owned Bry et Cie watch shop on Rue de la Paix to show me a piece she’d fallen in love with: a Reverso Lady in yellow gold (see Love, Loss, And Watches: Jaeger-LeCoultre’s Tribute). While I was still gasping at the price of the gold Reverso, the salesperson pulled another watch from the display: a steel men’s Reverso with a silver face on that characteristic JLC-honey ostrich strap. It was certainly appealing, but lightning didn’t strike until he flipped the case over to reveal a second black watch face displaying another time zone. Well, they had me at Duoface. We left the store with both watches, and despite the sweating I did until I paid off the bill I never regretted that purchase. I did eventually sell my first-generation Reverso Duoface in favor of the larger Reverso Grande GMT shown above, but a dual-time Reverso has been a staple of my collection ever since. Once I owned a Jaeger-LeCoultre watch, I began to read the brand’s literature and deepen my appreciation both for JLC’s heritage as the industry’s movement creator and its ongoing capacity for developing intriguing complications. One piece that became an obsession for me upon its introduction was the original Géographique: a world-time watch with an innovative clutch mechanism whose second crown simultaneously flipped the hands on a small subdial indicating the local time, a linked 24-hour indicator, and a perimeter ring indicating the city location. I can’t tell you how many duty-free shop windows I peered through to see this watch over the next year or so, but finally a sale event offering a then-staggering ten-percent discount convinced me to take the plunge at an airport watch shop in Brussels. Then, as now, the appeals of Jaeger-LeCoultre included interesting horological mechanisms, in-house development and manufacturing, attractive aesthetics, a lengthy and distinguished patrimony, and at least to some extent financial accessibility. I know that Jaeger-LeCoultre doesn’t like being characterized as a “value” brand, but to me there is absolutely nothing wrong with delivering great value for the hard-earned dollars paid by the buyer. And for me at the time the value equation delivered by Jaeger-LeCoultre was impossible to beat. Over time, I also came to appreciate the great names in today’s watch world who spent formative time at Jaeger-LeCoultre, including luminaries like Philippe Dufour and Eric Coudray, the developer of the Gyrotourbillon and Reverso Repetition Minutes movements. Shortly after adding the Géographique to my collection, I moved from watches to clocks with the purchase of a Tiffany-labeled Atmos, another great example of both innovation and patrimony. While my Atmos is currently in need of a service to replace the bellows mechanism at its heart, I’m very much looking forward to having it back swinging away on my office table. Over the succeeding years, I scratched my itch for all things Jaeger-LeCoultre in a variety of ways, and while the Reverso was at the center of much of the action I couldn’t stay away from its round-cased Master watches, either. Shortly after our wedding, my current wife gave me a lovely Master Ultra Thin that we picked out together. To me, this watch and the other ultra-thin variants that have succeeded it are true marvels. Clever touches like the use of frosting on one-half of the flat markers and hands to give an impression of depth while minimizing thickness, a super-thin movement with suspended barrel that does not sacrifice robustness that is certified through a 1000-hour functional test, and high-quality finishing all contribute to a coherent and impressive whole. Mrs. GaryG did okay during this period as well, with the addition of the Reverso Gran Sport Duoface and a small vintage LeCoultre piece that are among those shown in the image below. A couple of the watches from this period are no longer in my collection. The lovely Reverso Art Deco in pink gold departed several years later in favor of a skeletonized Vacheron Constantin as I did a bit of consolidation of my set of open-worked watches. And I’m still kicking myself for selling the uniquely Jaeger-LeCoultre Memovox in pink gold with its gorgeous blued central sweep seconds hand, chunky and satisfying solid gold case and deployant buckle, raucous alarm bell, and gracefully yellowing tritium markers. 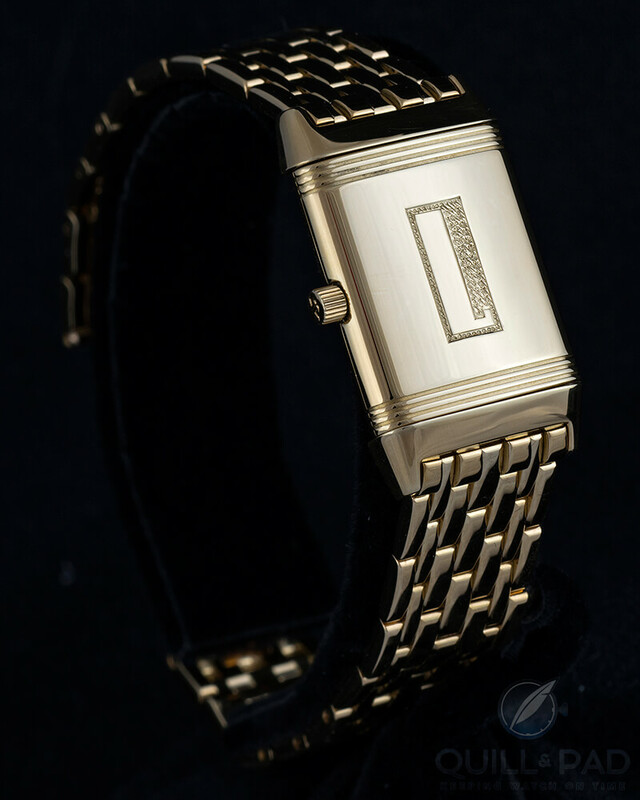 One Jaeger-LeCoultre watch that I had admired for over a decade, but had been unable to afford as a new watch, was the Reverso Repetition Minutes with its astounding rectangular movement and shaped gongs. I’d been keeping an eye out for a pre-owned example, and as luck would have it not only found (and bought) a piece on offer but in the process met my good pal Allen, who subsequently introduced me to the other members of what is now our “NorCal Gang” of collectors – which in turn led to an entire world of contacts with brands and independent watchmakers, visits to SIHH and Baselworld, and the wealth of watch-related friends I have today. Repeat after me: it’s all about the people! While my collection has broadened and deepened over recent years, including a hefty emphasis on independents and significant purchases from major brands including A. Lange & Söhne and Patek Philippe, Jaeger-LeCoultre continues its hold on me. The past few years have seen the addition of the Tribute to Reverso 1931 U.S. limited production 2012 (whew! ), the Reverso Grande GMT pictured above, and a vintage piece I’d long coveted: the Futurematic with its unusual bumper self-winding mechanism. I’m particularly keen on my personal Futurematic as it’s a “Jumbo” 37 mm piece that is contemporary in size. The watch itself is in splendid condition belying its 60+ years of age. I’ve developed a growing appreciation for classic Jaeger-LeCoultre vintage pieces; among others, I bid on (but did not win) a flawless original Geophysic that drew a record sale price for a vintage Jaeger-LeCoultre at Phillips Geneva Watch Auction: FOUR in November 2016. And among recent new introductions, I have my eye on the stunning blue-dialed boutique-edition Memovox; maybe it’s time that I make up, at least in part, for selling that pink gold piece! From the enthusiasm – and purchases by collectors – that greeted Jaeger-LeCoultre’s 2017 SIHH introductions, including not only the refreshed sector-dial versions of several classics but blue-dialed variants on other pieces that made my mouth water, it’s great to see that JLC is not only staying relevant but continuing to entice a broad swath of the collecting community. I’m fairly sure that I’ll be back! And I’d love to hear about your Jaeger-LeCoultre watches and collecting interests in the comments section below. For more on Jaeger-LeCoultre, please visit www.jaeger-lecoultre.com. JLC was also the “gateway drug” for me into the rabbit hole of horology and this mad obsession. Thanks, Roman! Love the term “rabbit hole” to describe our obsession — so true! One of my first real serious watches was the Duoface also, which after half a dozen years I decided to upgrade to the Grande GMT. I had told my wife I’d move the Duo to make room for the GMT but alas, after acquiring the GMT I couldn’t part with it (Duoface). I added a couple bespoke straps in ladies sizes and tried to pass it on to her but although she shares my passion for watches and has a quite decent collection of her own, it just never got any wrist time. So I got the classic honey ostrich strap and it’s still in my collection and still gets worn regularly. Most recently I added the Geophysic World Time (bought sight unseen) and its one of my favorite pieces yet. Of all the various pieces by major brands I own, I’ll agree JLC has a special place. I’ll definitely keep a place open for another! By the way I had also meant to send that this was an excellent article which I thoroughly enjoyed reading! Thanks so much for taking the time for your follow-up message — and I’m very pleased that you enjoyed the article, Bruce! Great selection of JLC pieces! I have to say that I miss my first-gen Duoface, but I suppose one can’t keep them all. I am motivated now to pick up a honey ostrich strap for at least one of my JLC watches — it’s a true classic. Happy wearing and hunting, and keep us advised of your next acquisition! Great article! I recently jumped into the world of JLC and purchased the Geophysic True Second and absolutely love it. Truly underrated complication IMO and the movement has fascinating depth to it.